College tuition keeps going up, but not by much. 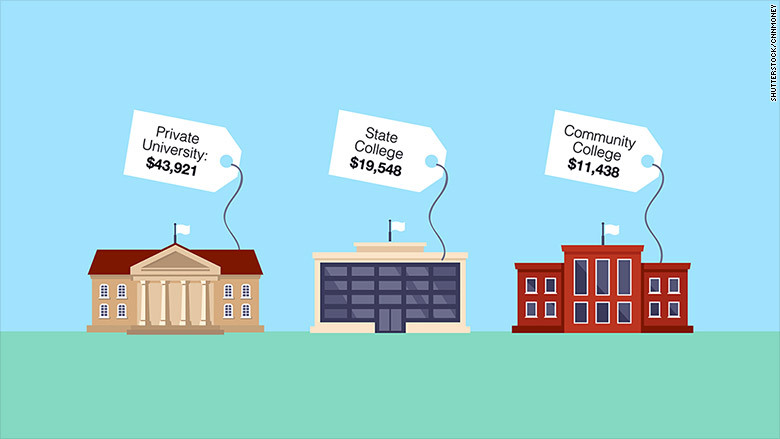 This year, private colleges are charging an average of $1,476 more than last year. And public schools are charging $617 more for in-state tuition, room and board, according to the annual report from The College Board released Wednesday. The good news is that's one of the smallest increases since the 1970s. But the bad news is that costs are outpacing inflation and rising faster than family income across the board. While middle class families saw their median income shrink by 2% over the past decade, the average sticker price at a private institution jumped 25%. This is one reason why there is so much concern about college affordability now, said Sandy Baum, a professor of education policy at George Washington University and co-author of the report. "What's really notable is that over the last decade, no one is better off. It's not just low-income families that are having trouble paying, but families at the top are still feeling the pinch because they have not seen their real incomes rising," she said. Most families don't have to pay the published tuition price, or "sticker price." The net price is what the student actually pays after receiving scholarships and grant money. The amount borrowed per student is down for the fourth year in a row, driven down largely by a decline in graduate school enrollment. And student aid from grants and scholarships that don't have to be repaid is up by $540 per undergraduate and $1,380 per graduate student.